It took millions of years for early humans to be civilized and during this period they did a lot of efforts to improve themselves. 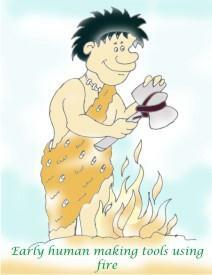 In this educational article we are going to explore some more inventions done by early humans. Parents should provide such educational contents to their kids to make them understand our evolution and value of natural resources for us. 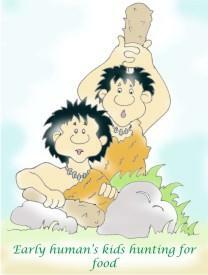 In our previous article about Early human's life of this educational series, we discussed the hard life style and efforts made by early humans to improve his struggling life such as - searching food, discovery of tools and discovery of fire. They were living a wandering life. Their life style was very hard, had no stability and spent all the day in search of food. But eventually they had taken certain intelligent decisions and started to learn many new things that improved their life and got settled up to an extent. They left the caves and started living near rivers, learnt to have roasted flesh instead of raw food and also discovered making different types of tools with metals to accomplish different purposes. Life in jungle caves was very difficult for early humans as they regularly required to go far off river bank for drinking water. As water is the essential element for human life so, he decided living near river bank. Now they could get water easily and could use it for their various activities. They also knew that all animals come to river banks for drinking water, where they could be hunted easily. The fishes in river was their best food, they could clean their living areas with water and could bath daily. Thus, the life of early humans became settled up to some extent now. Earlier they used to live in far off caves and it was very difficult to meet each other but now they started living in groups near river banks to help others and protect their family from wild animals, together. Early human began noticing things around them now and started thinking more about those things. They saw the seed in the soil grew into plants and got the idea of growing plants for their food. They started collecting and sowing seed in the soil thus start growing food for his family. This was the beginning of farming. For farming, they used stones to dig the soil first. Later on they improved their tools using wood. Now they could give proper shape to their tools that were made up of wood and stones. In early days, early humans would have found the metal in the form of volcano lava. After getting cool, ores in lava would have been converted to metal. But they could not make it on their own. But with time they would have observed that the jungle fire usually left many burnt products after it. They would have found that some of the partially melted stones converted to solid metals as cool residuals. This gave them the idea of extracting metals from such ores. Now they were aware of how to extract metals from the hard stones. They started melting such stones in fire and began to make tools for farming also. Most probably, this way, they would have made plough for the first time that had to be used for softening the soil for farming. This made the early humans the real farmer and they made their farms near river banks and started living in joint family. As he was not able to do all farming works alone so they divided their works too. This was the seed of a civilized early human. 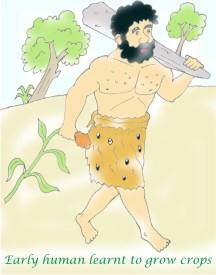 In this article, we discussed about improvements in early human's life. How they started observing their surrounding things and started using their mind for making those things useful for him. Now, their life got settled and they began started to live in groups. This was the initial step of being civilized. 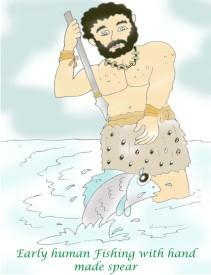 In our further articles we shall discuss some more interesting inventions by early humans.